Between March and November 2011, the Gordon and Betty Moore Foundation's (GBMF) Environmental Conservation Program assembled a small group of thought leaders and practitioners to increase awareness, facilitate the exchange of information, and generate vibrant conversation to transform ecosystem services (ES) theory into tangible actions. This 7-seminar series convened an exceptional group of world-class speakers from leading institutions and organizations to provide participants with a holistic view of ES. Through its consideration of topics ranging from the theoretical roots of ecosystem services, to existing policy and management tools that incorporate the concept, to its applications for improved resource management decision-making, the series aimed to catalyze the uptake of this new paradigm among the conservation community. The GBMF Environmental Conservation Program's goal is "to change the ways in which people use terrestrial, freshwater, and coastal marine ecosystems to conserve critical ecological systems and functions, while allowing sustainable use." "Ecosystem services are the benefits people obtain from ecosystems. These include provisioning services such as food, water, timber, and fiber; regulating services that affect climate, floods, disease, wastes, and water quality; cultural services that provide recreational, aesthetic, and spiritual benefits; and supporting services such as soil formation, photosynthesis, and nutrient cycling" (Millennium Ecosystem Assessment, 2005). Download the full Seminar Series as a PDF here (28.7MB) or click on the links below to view articles and presentations. If you have trouble viewing any of the files, click to download the free Adobe Reader. 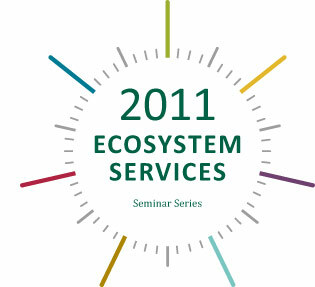 Barton H. "Buzz" Thompson, Jr.
Adam Davis, Solano Partners, Inc.
Ecosystem Services Seminar Series. Palo Alto: Gordon and Betty Moore Foundation, 2012. PDF e-book.